WASHINGTON (AP) — Mired in the Korean War, President Harry Truman began plotting a federal government takeover of American steel companies to head off a strike. Before he followed through with his plan, he secretly asked Chief Justice Fred Vinson, his close friend and poker buddy, how the Supreme Court might react. Vinson told his friend not to worry, and Truman proceeded with the takeover. A few months later, the Supreme Court found his actions unconstitutional. The account is one of several instances of presidents and justices appearing to blur the constitutional separation of powers that appear in a new history of American presidents at war. That relationship between the White House and the Supreme Court is being examined anew following the bitter confirmation fight over Brett Kavanaugh, who angrily denounced President Donald Trump’s political opponents during a Senate hearing. Kavanaugh, who previously served in President George W. Bush’s White House, took the concerns about his appearance of partisanship so seriously that he wrote a Wall Street Journal op-ed on the eve of his confirmation to assert his belief that “an independent and impartial judiciary is essential to our constitutional republic.” He blamed some of his partisan rhetoric on the intensity of his confirmation process, which was nearly derailed by sexual assault allegations. Kavanaugh was narrowly confirmed on Saturday and will take his seat on the high court this week. He was advised closely on his handling of the misconduct allegations by Trump advisers, including White House counsel Don McGahn. Beschloss writes about the relationship between President Lyndon B. Johnson and his close friend Abe Fortas, whom he nominated to the high court in 1965. After Fortas was confirmed, he “wound up quietly helping the president write speeches and choose Vietnam bombing targets,” Beschloss writes. The close ties between Johnson and Fortas helped scuttle the latter’s nomination to be chief justice after they were revealed to the Senate. Presidents have also more overtly called on Supreme Court justices to help them in moments of political peril. After the World War II bombing of Pearl Harbor, President Franklin D. Roosevelt feared that he would be blamed for the attack because he moved the U.S. Pacific Fleet from San Diego to Hawaii. Seeking to get ahead of a congressional investigation, Beschloss writes, Roosevelt tapped Supreme Court Justice Owen Roberts to oversee a supposedly independent commission. “Roberts was known to be unassertive, which made him subject to the president’s importuning,” Beschloss writes. 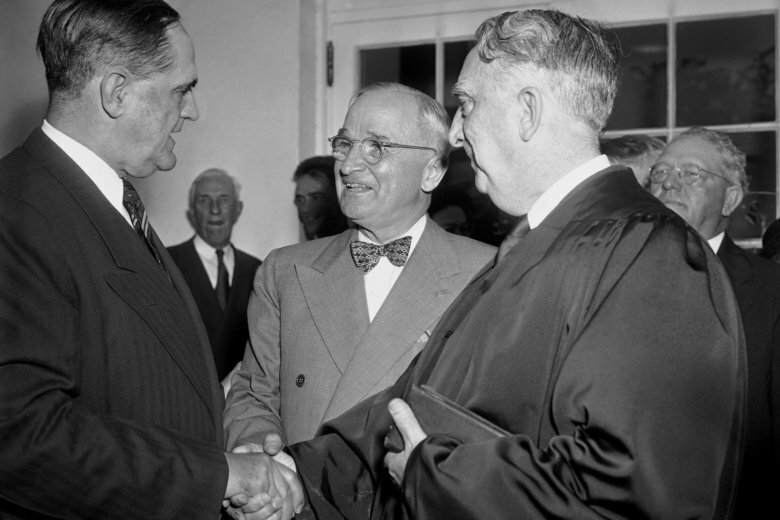 Roberts met privately with Roosevelt at least three times after the commission was announced. His report spared the president and pointed blame at local commanders, Gen. Walter Short and Adm. Husband Kimmel. Trump White House officials have both praised Kavanaugh’s conservative record and argued he will be an impartial justice. Beschloss’ book, which will be released this week, examines how eight wartime presidents, from Thomas Jefferson to George W. Bush, dealt with their powers under the Constitution. He writes extensively about Johnson, who he says became more paranoid and emotionally troubled as the Vietnam War unfolded. He was intently focused on those he viewed as rivals, saying on secret tapes that Martin Luther King, Jr. was “controlled completely” by communists and claiming that Robert Kennedy was paying King to stir up urban riots. Beschloss also writes that Johnson still hoped Democrats would draft him for their 1968 presidential nomination, despite announcing publicly that he would not seek or accept the nomination. Johnson had planned to be in Chicago, site of his party’s convention, for a birthday celebration, but ultimately skipped the gathering after his advisers surmised that the party would not nominate him. Johnson wound up watching the proceedings on television from his Texas ranch.